English Heritage | A balanced diet . 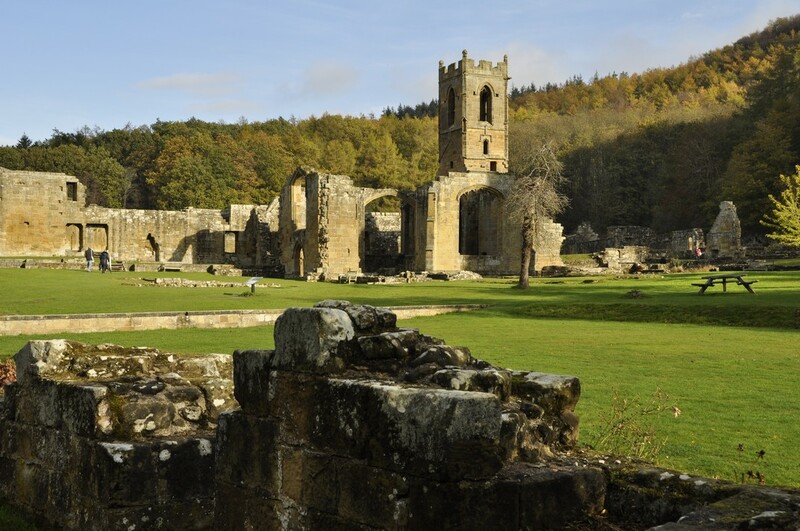 . .
Nestling under the Cleveland Hills in North Yorkshire, about half way between Thirsk and Middlesbrough along the A19 (map), Mount Grace Priory has stood proudly overlooking this beautiful landscape for over 600 years. 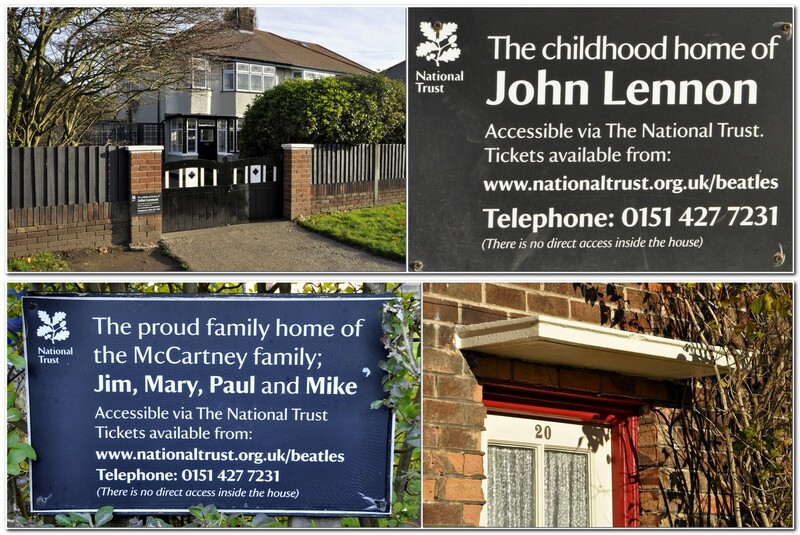 It is owned by the National Trust, but managed by English Heritage. 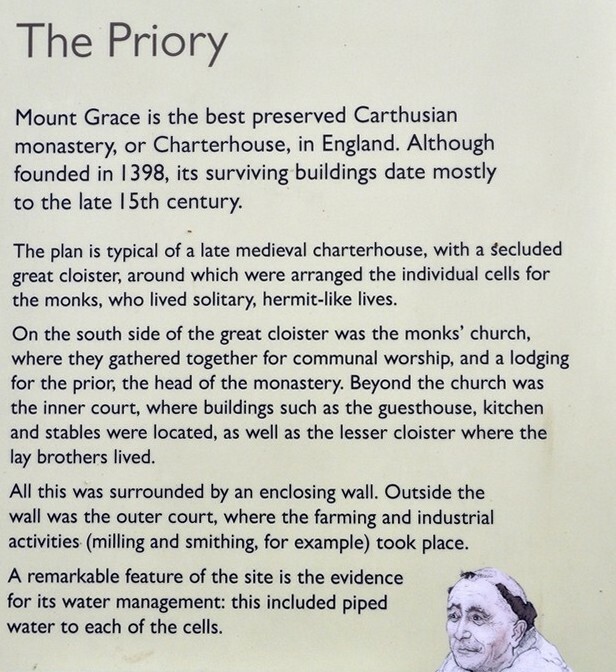 Founded in 1398 by Thomas Holland, 1st Duke of Surrey, Mount Grace is a walled Carthusian priory or Charterhouse, of which there were several throughout England. It’s regarded as the best preserved. 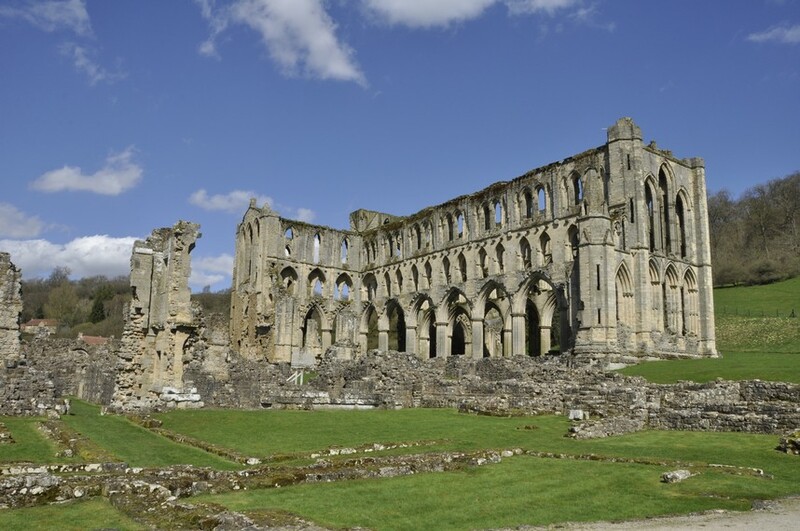 The priory was finally closed down in 1539 at the time of the dissolution of the monasteries under King Henry VIII. Built from a beautiful yellow stone that glowed in the early winter sun last Sunday when we visited, Mount Grace was a community to fewer than 20 monks, living more or less as hermits each in his own cell (6). Actually, these cells must have been the 15th century equivalent of a ‘des-res’. These surrounded a large cloister (5), were two storey buildings, with piped in water, outside latrine, and a garden that each monk attended. By the entrance door there is a large niche through which food and other necessities were passed to each monk. One of the cells (8) has been reconstructed. As we entered the cloister the air was filled with the eerie sound of pheasants calling among the trees on the surrounding hillside. The priory was dedicated to the Assumption of the most Blessed Virgin in Mount Grace, and an small but impressive ruined church (4) lies at the center of the priory compound. 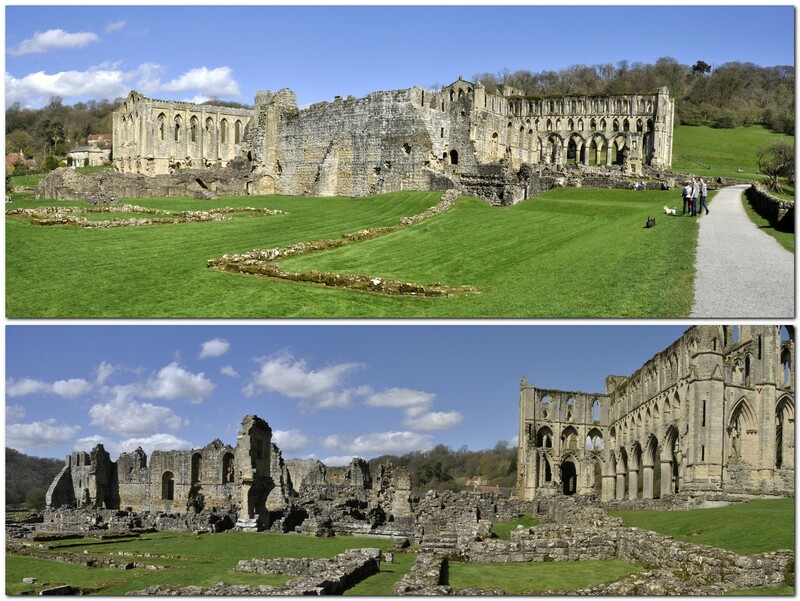 More photos of the priory ruins, and a little more history can be viewed in this album. The site was acquired in the mid-17th century by Thomas Lascelles, and then in the 1740s to the Mauleverer family. 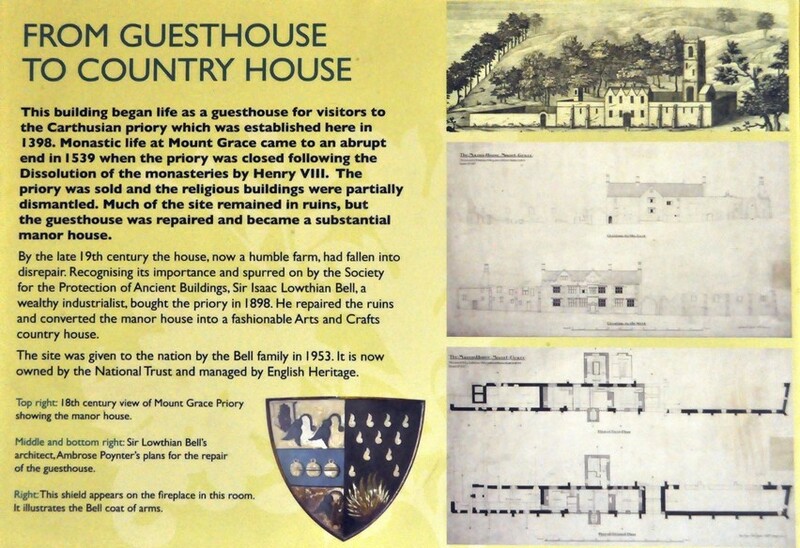 The priory guest house became the heart of the manor house we see today. 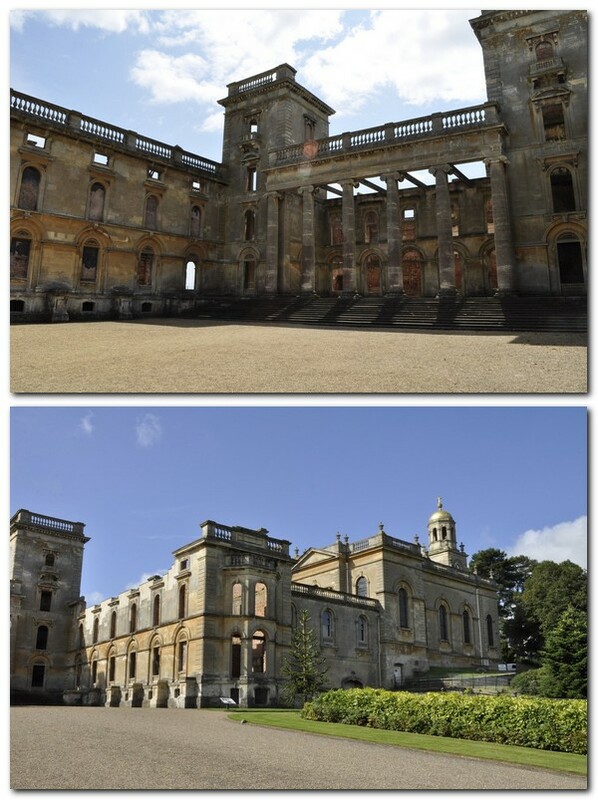 But its current aspect was the work of a wealthy industrialist at the end of the 19th century, Sir Lowthian Bell. Just a few rooms are open to the public. 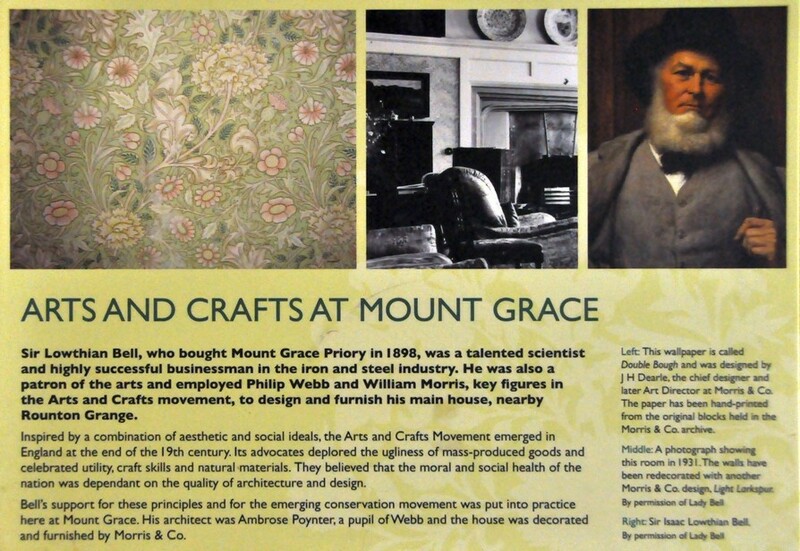 A carpet designed by William Morris is on loan to Mount Grace, and is laid in one of the ground floor rooms. 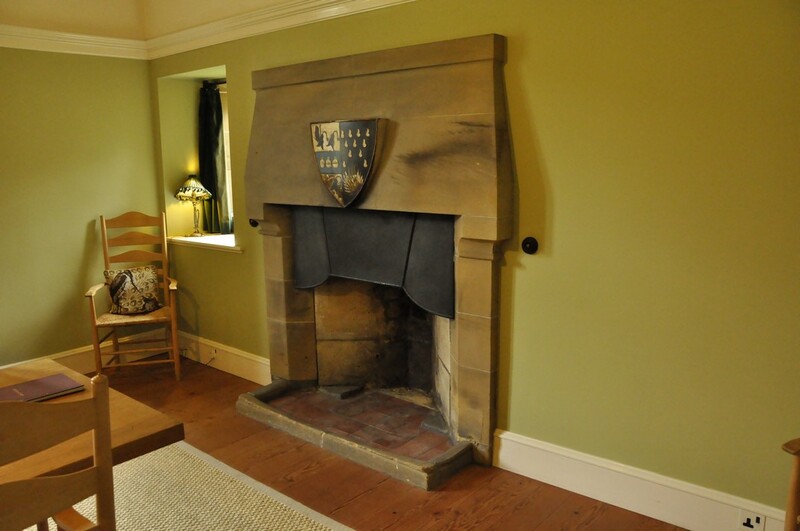 The coat of arms of the Bell family is displayed above the fireplace in another room on the ground floor. The west facade of the manor house is covered in Virginia creeper, glowing red in its full autumn glory, overlooking a small, but carefully laid out terraced garden, leading to several pools that were used by the monks to raise fish. It was nice to see plant name labels throughout the garden. Mount Grace Priory, house, and gardens were a true delight. We’ve often passed the entrance on our way north to visit our younger daughter Philippa and her family in Newcastle. But this time we were determined, weather-permitting, to stop off and explore the site. And that’s how we spent a very enjoyable three hours last Sunday morning, before hitting the road again, heading south to home in north Worcestershire. Sylvester’s House. That’s what Chysauster means; ‘chy’ is Cornish for house or home. But whether Sylvester ever lived there and who he was I guess we’ll never know. 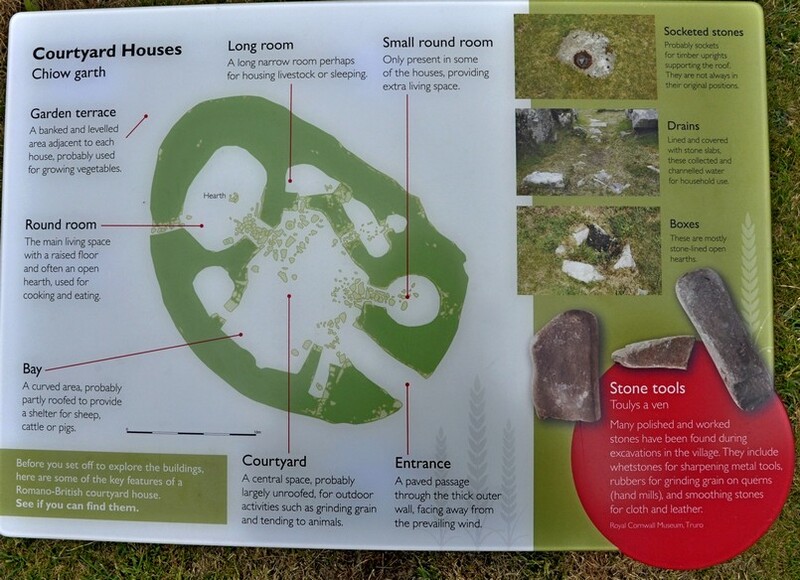 Because the remains of this Iron Age village date from Romano-British times, some 1800-2000 years ago. The Romans never really penetrated into Cornwall, apparently. 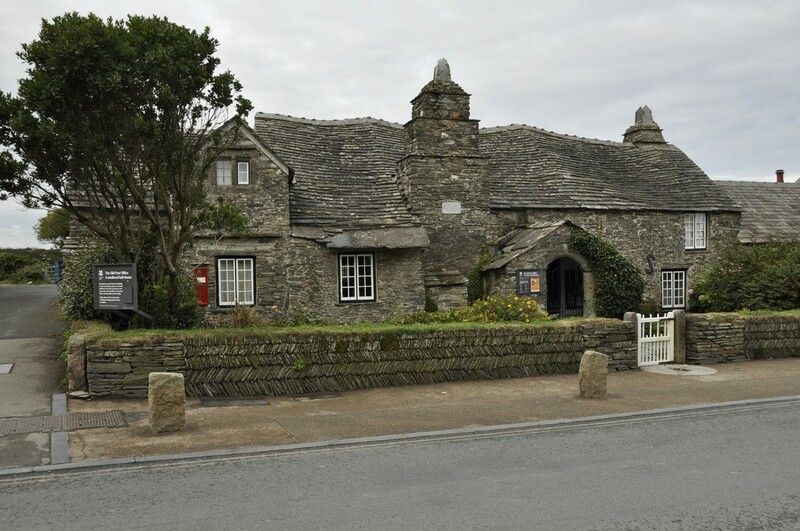 Thus Chysauster, with its unique courtyard houses (found only in Cornwall and the Scilly Isles), is a very important site in the nation’s history. 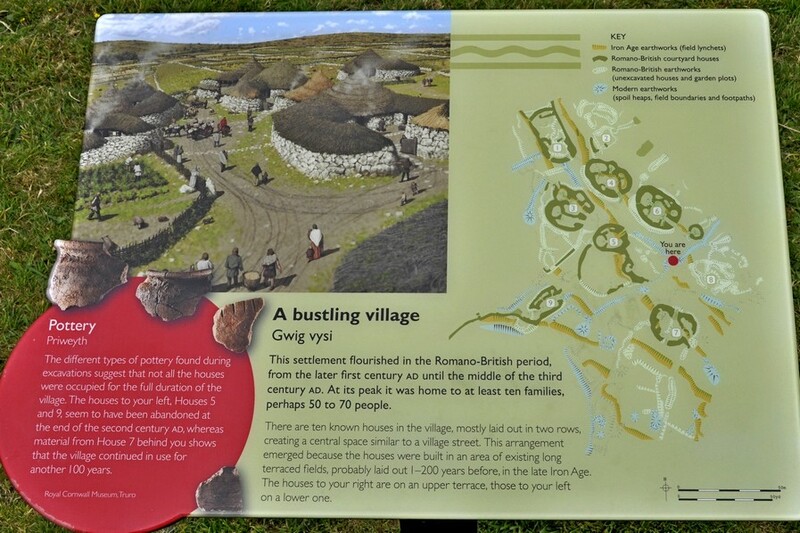 Courtyard houses are found in several locations, but the village at Chysauster is one of the best preserved. As I walked on to the site I had this feeling that the village had once been a thriving community. I could imagine children playing among the houses, smoke rising from each roof. A busy place. We spent about an hour walking from one building to the next, fascinated by the layout of each house with its rooms off the central courtyard, and even a backdoor. Take a look at more photos here. 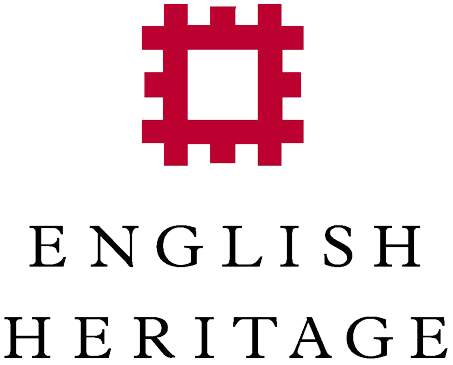 This is the link to English Heritage. Did King Arthur live here? Did he even exist? Whatever the truth of the myth, Tintagel Castle will forever be linked with his name. It’s certainly an iconic site jutting out into the North Atlantic, battered constantly by winds and storms. It was quite windy on the day of our visit, but thankfully dry. Click here to download a phased plan of the castle, which shows its occupation over almost a thousand years. 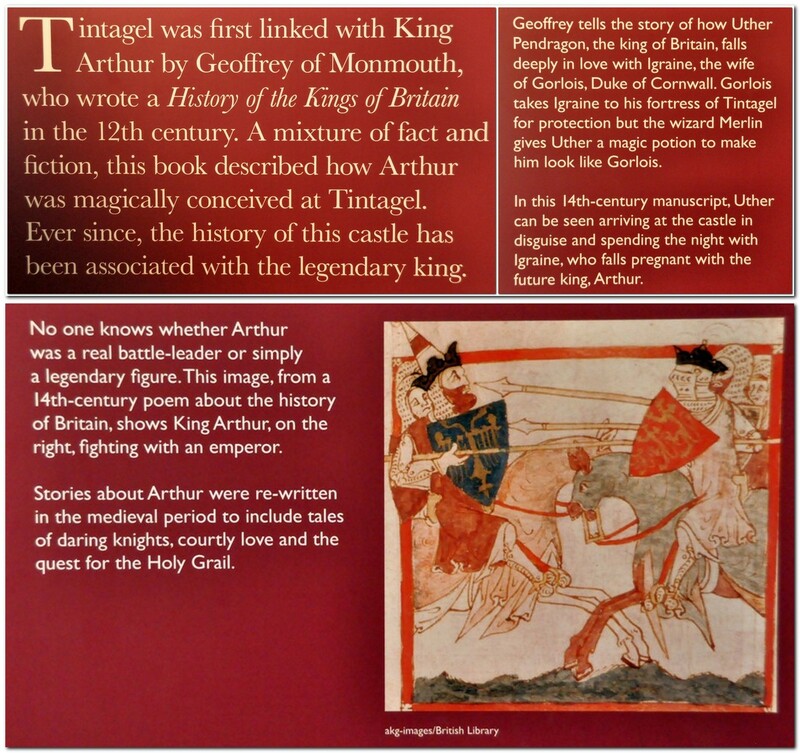 Geoffrey of Monmouth has a lot to answer for, because much of what we ‘know’ of our history prior to the 12th century is a mixture of fact and fiction that he wrote in his History of the Kings of Britain. 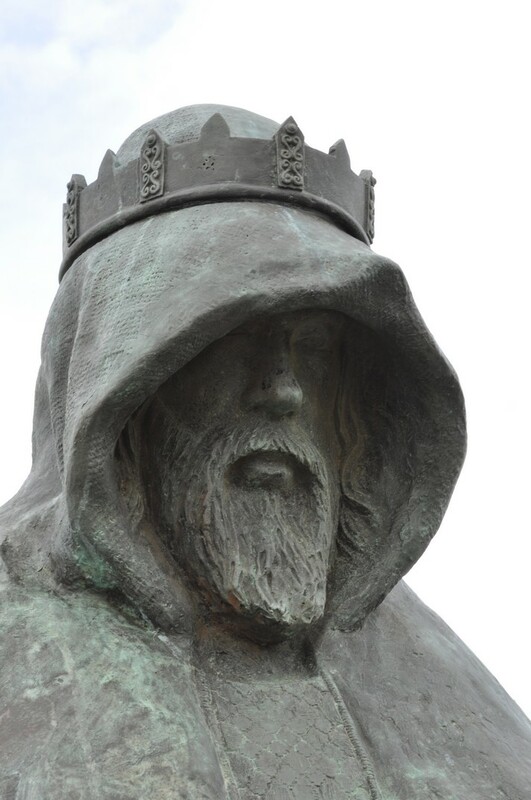 Among the many myths that he conjured up is the tale of King Arthur and his links with Tintagel Castle where, claimed Geoffrey, Arthur was conceived. Tintagel Castle was once home to a thriving community of more than 300 persons. But since much of its history derives from the so-called Dark Ages (the period between the exodus of the Romans in the 5th century AD and the arrival of the Normans in the 11th). 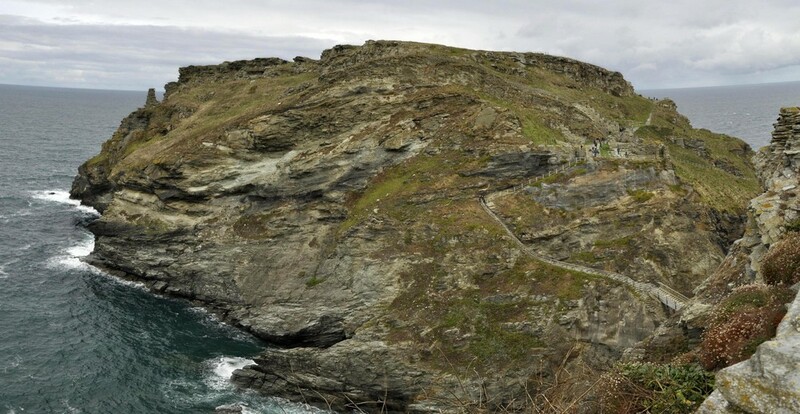 Tintagel Castle island is dotted with the remains of many houses. We arrived at Tintagel just before 09:30. I wanted to be sure of a parking place knowing that it can become very busy. The castle opened at 10:00, so we took a slow walk down to the entrance, about half a mile, and quite steep in places. We opted for the Land Rover ride (at £2 each) back up to the car park after our visit. The cafe was just opening, so we enjoyed a quick coffee before registering for our visit, and getting some wise advice about how to tackle the site. 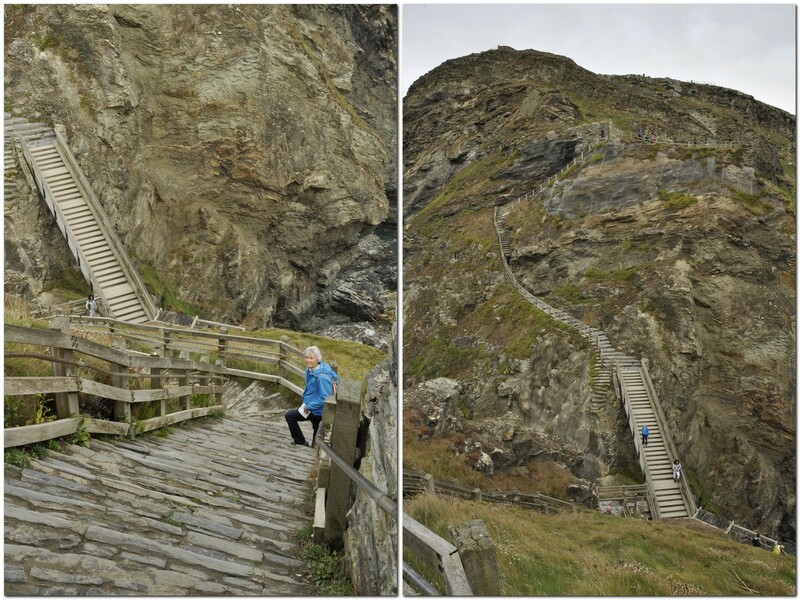 There are lots (and I mean lots) of steps at Tintagel, some very steep indeed. 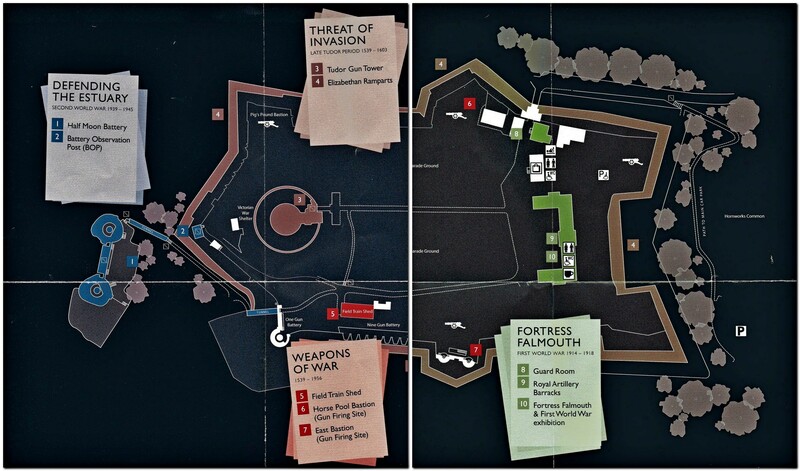 The person on the ticket counter advised us to enter the site through the upper entrance (just before 1), and straight into the mainland courtyards (3 and 4) that overlook the main entrance and island courtyard and Great Hall (6). There is a set of extremely steep steps down the cliff to then cross a bridge and climb into the main ruins. The walk up to the upper entrance and courtyards was certainly gentler than had we visited the main island first then returned to view the courtyards (and climb that set of stairs) as we saw many other visitors doing later one. And by visiting the courtyards first, we had a panorama over the island ruins to get our bearings. What goes down must go up . . . Check out the full album of photographs. It takes about an hour and a half to walk round the ruins and appreciate everything that Tintagel has to offer. The views over the cliffs, north and south down the coast are typical Cornwall, and you’re left wondering how a community managed to survive for so long in this rather desolate spot. Moving forward to the 12th century, Restormel is a Norman castle alongside the River Fowey in Lostwithiel. 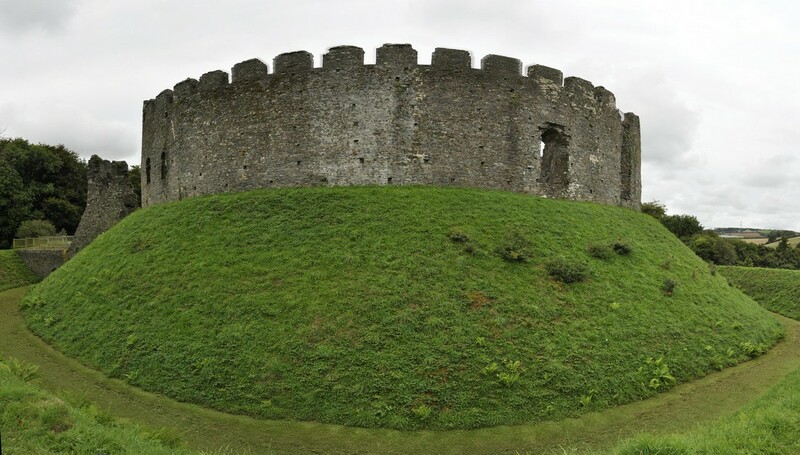 Its circular shell keep is unusual (the round tower at Windsor Castle is also a shell keep), built on a mound surrounded by a dry (and quite deep) ditch. 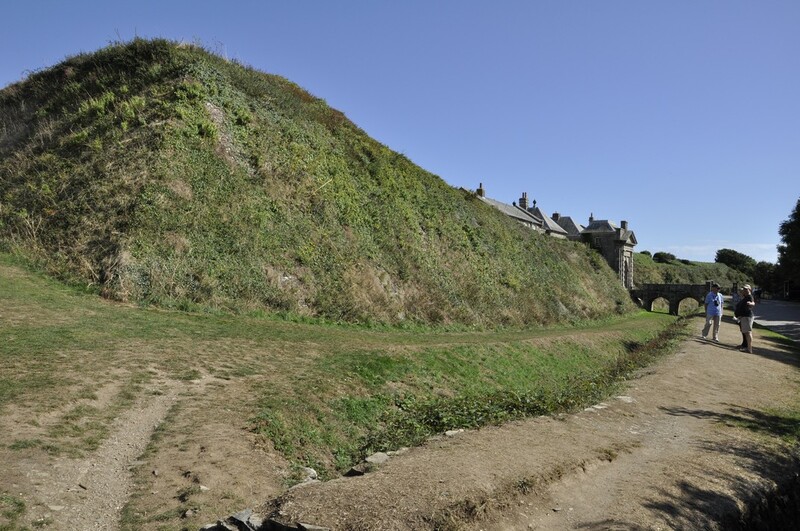 The ruins are remarkably well preserved, and in addition to wandering through the various rooms at ground level, English Heritage has provided access to the battlements, from which there is a good panoramic view over the surrounding countryside. 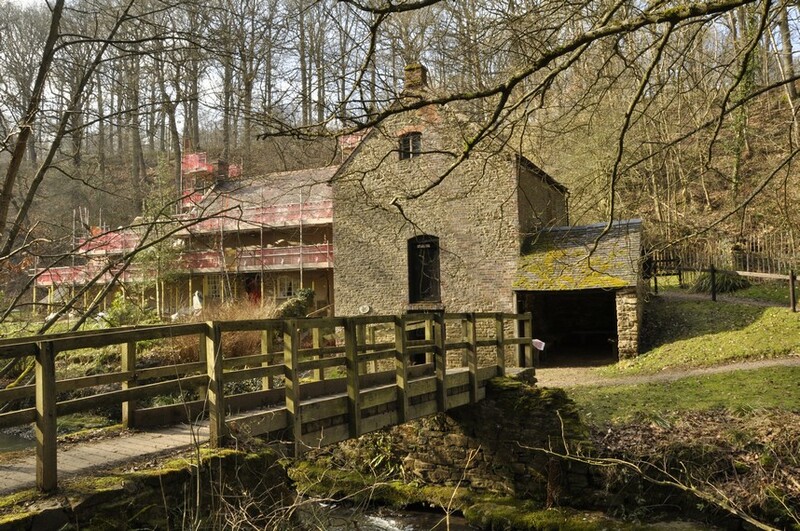 You can read a detailed history of Restormel here. 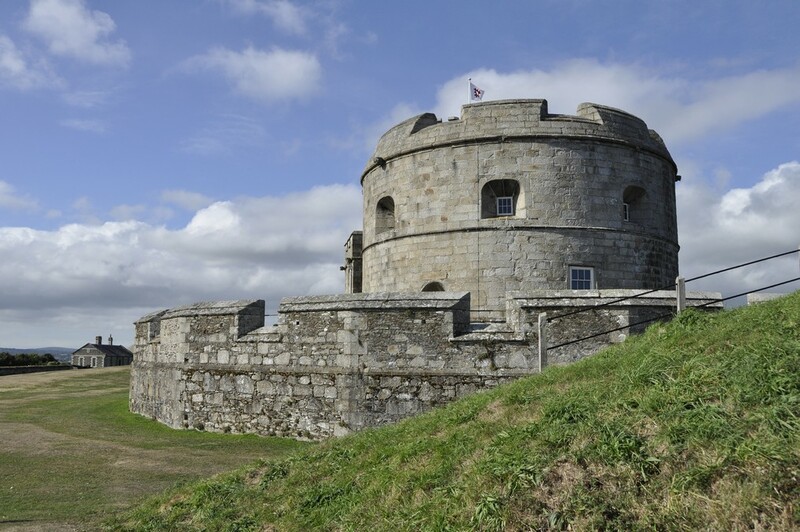 Guarding the approaches to Falmouth, Pendennis Castle has proudly stood on a peninsula overlooking Carrick Roads since the time of Henry VIII in the sixteenth century. 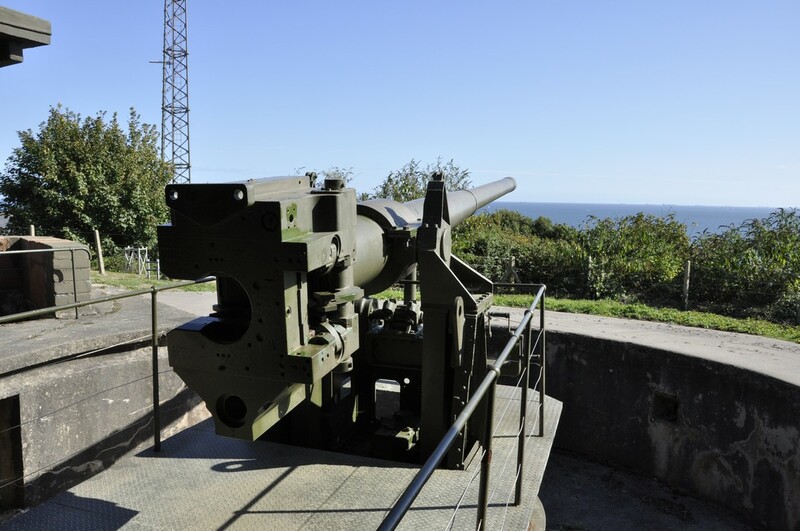 And it remained an important fortress right up to the Second World War when guns were installed to combat any threat from German naval vessels. 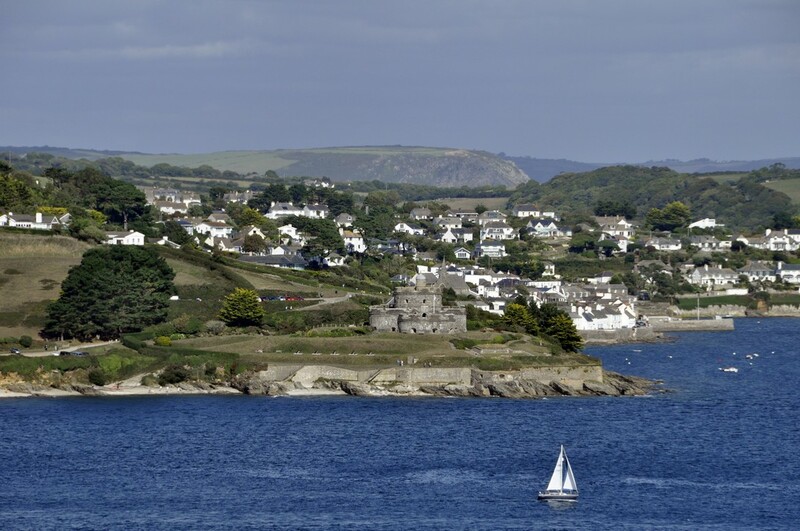 Across the estuary is another Tudor fortress, St Mawes Castle, a mirror image of Pendennis. 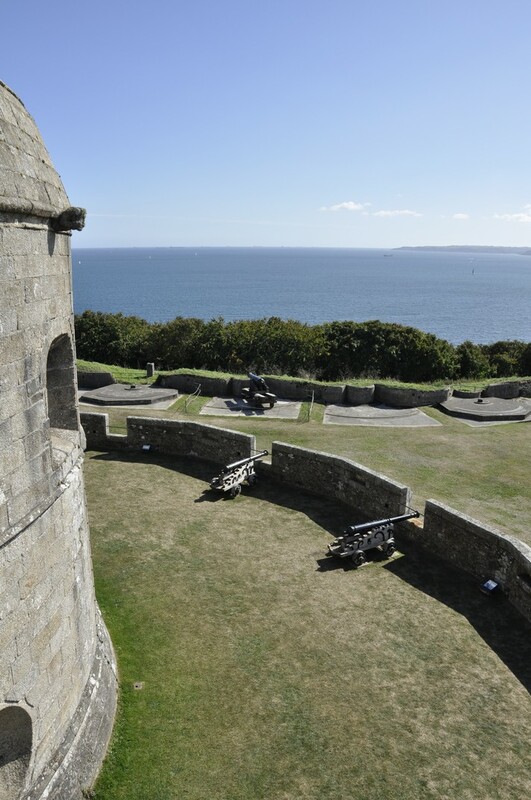 During Tudor times, the guns from each could reach half way across the estuary, this protecting Falmouth and its harbor from both sides. 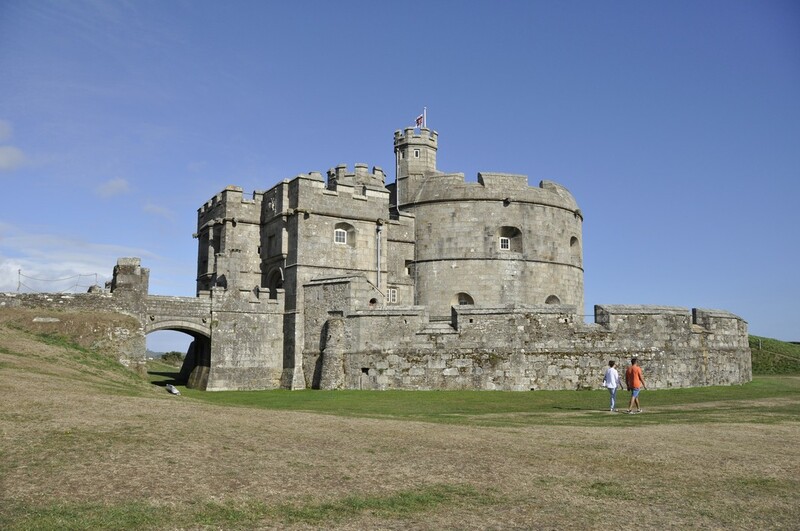 In July 2016 we visited Calshot Castle, that guards the approaches to The Solent near Southampton, and is another of Henry VIII’s coastal fortresses. 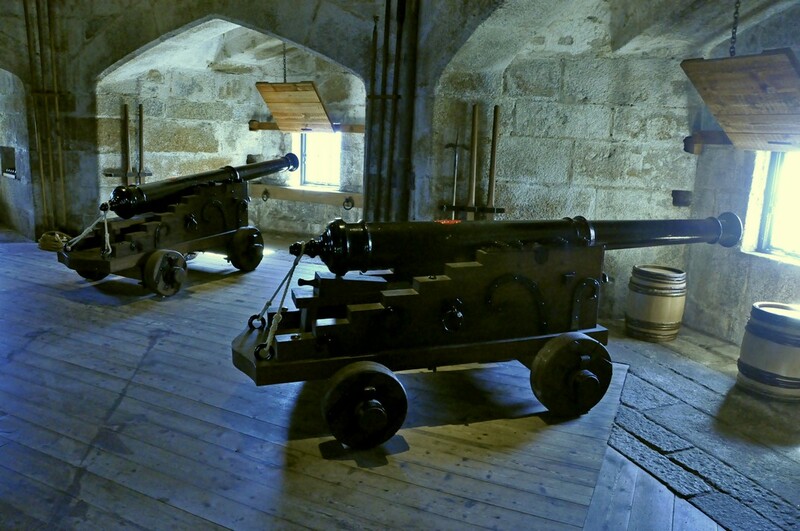 Pendennis has a fine collection of cannons inside and also on the battlements, as well as the Second World War guns at Half Moon Battery. The castle is not just the round tower. 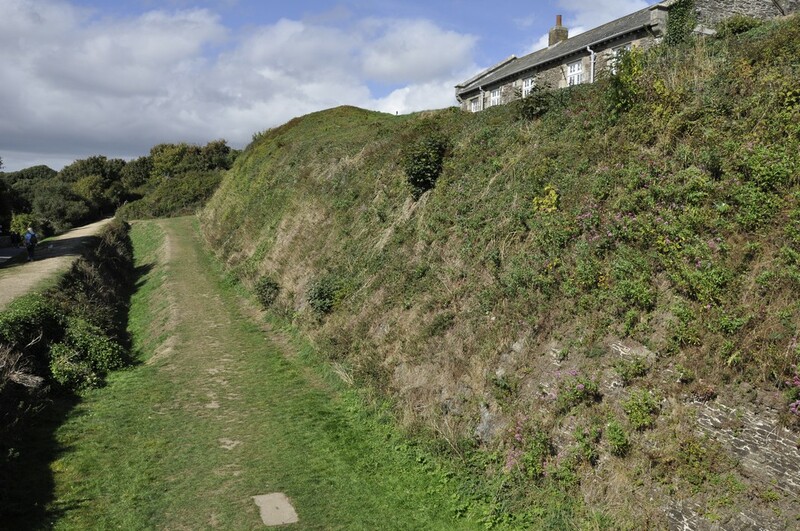 There are extensive 18th century barracks and parade grounds enclosed within major earthworks, ramparts constructed during the reign of Elizabeth I. The barracks (on the right) and guardhouse on the left, from the roof of the Tudor round tower. Steph and I began planning a short, one week break in Cornwall way back in the Spring. 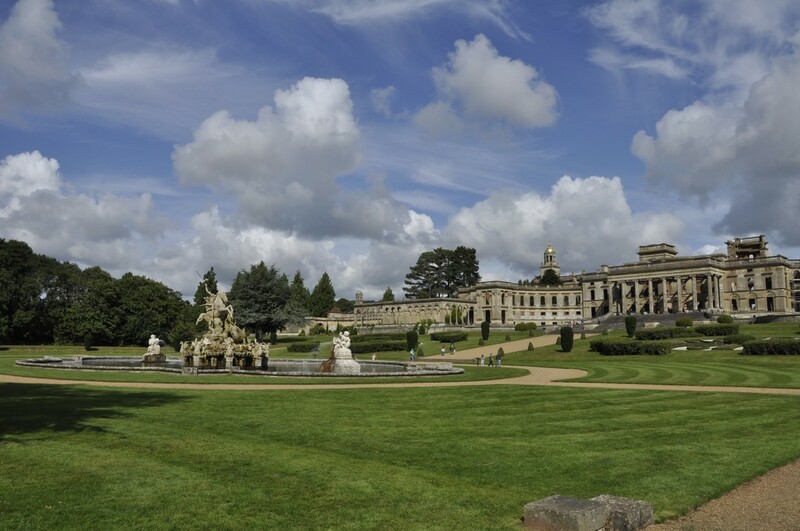 As followers of my blog will know by now, we are avid members of the National Trust and English Heritage, and throughout the year we try to make as many visits as the weather and other commitments permit. In Cornwall, we wanted to explore as many NT and EH properties as we could fit into the six days, and the two days of travel. Eighteen was our tally! 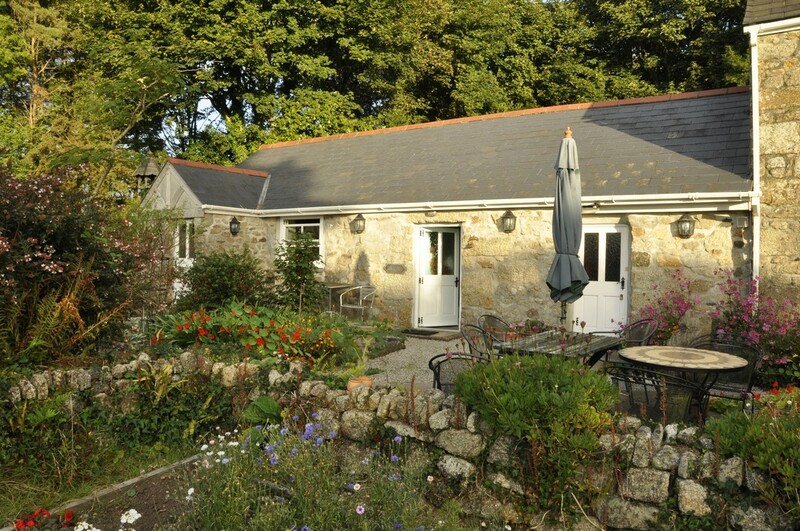 We chose a small studio cottage, suitable for a couple, just north of Helston on the south coast, a round trip of more than 500 miles (including the side trips to a couple of National Trust properties on the way there and back – see map). Dovecote Cottage was located at the end of a 2 mile drive down a narrow lane (with passing places), next to a former farmhouse. It was very peaceful, and comfortable. Our home (in Bromsgrove, in northeast Worcestershire) is less than 5 miles from the M5 motorway, the main arterial to the southwest. The M5 and roads south into Cornwall like the A30 can be notoriously busy during the summer, and delays of many hours are not uncommon as lines of motorists (many towing caravans) snake their way to the coast and sunshine. On the way south we had a traffic-free journey, but on our return on the following Saturday we had to make one detour to avoid a jam at road works near Tiverton (on our way to Knightshayes), and we also hit a long queue of traffic attempting to navigate the bridge over the River Avon, backing up about 10 miles although constantly moving. During the six days touring Cornwall we clocked up another 500 miles, for a total of 1086 miles for the whole holiday. Heading south, and just 12 miles east of the M5 near Taunton, we visited Barrington Court, a Tudor manor house built between 1538 and the 1550s. It was the first house acquired by the National Trust (in 1907) and became the residence of Col. Abram Arthur Lyle (of the sugar refining company Tate & Lyle) who refurbished the property, installing his collection of historic woodwork, and converting the next door 17th century stable block, Strode House, into a residence. 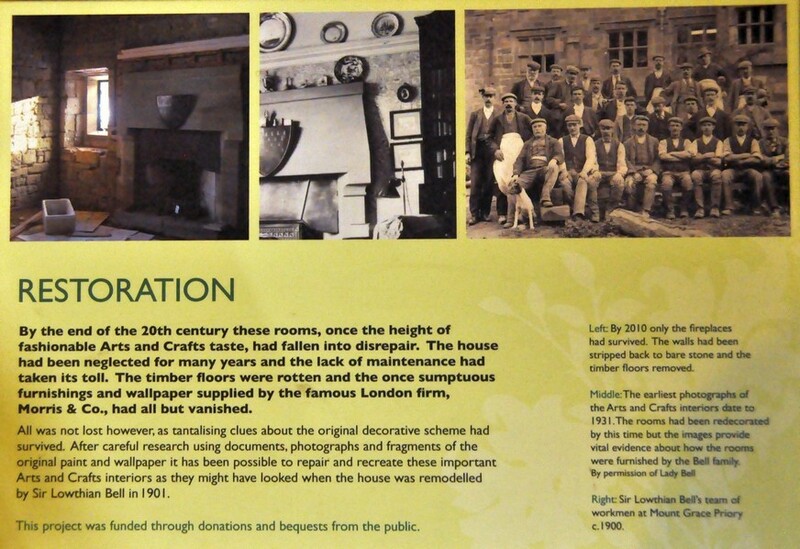 Check details of Barrington Court on the National Trust website. 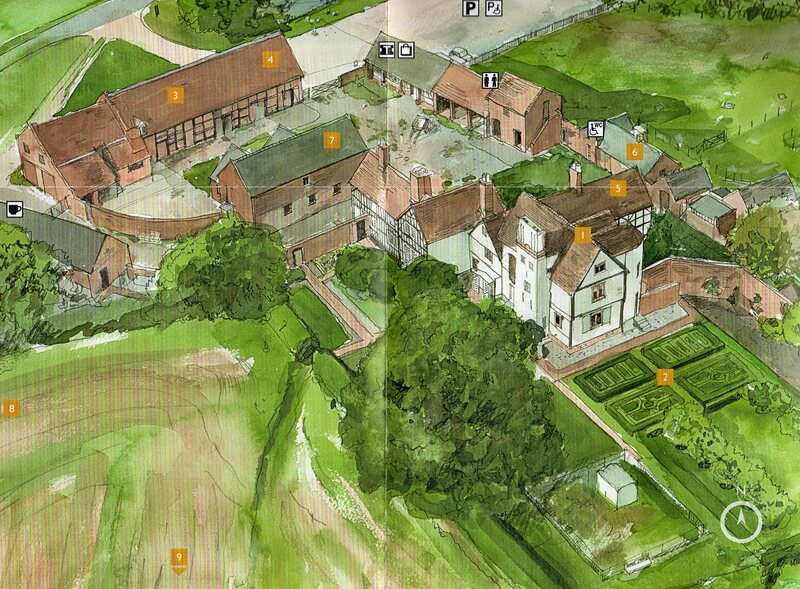 The south face of Barrington Court (on the right) and Strode House on the left. The connecting corridor between the two can be clearly seen. Barrington Court is unfurnished, but that also permits better appreciation perhaps of the fine woodwork. The long gallery on the top floor is particularly impressive. In several of the bathrooms, reclaimed Delft tiles surround baths and wash basins. 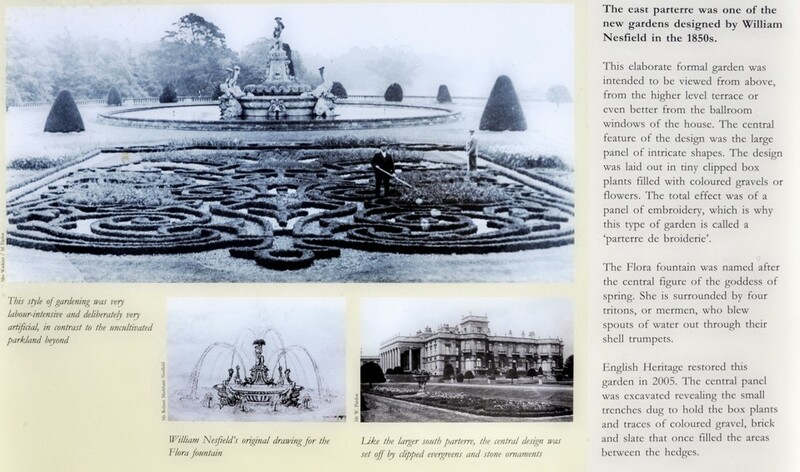 During the 1920s refurbishment Lyle had asked Gertude Jekyll to design a series of formal gardens surrounding the house. In the eventuality not all were constructed, but what there are now are beautiful accompaniments to an elegant house. 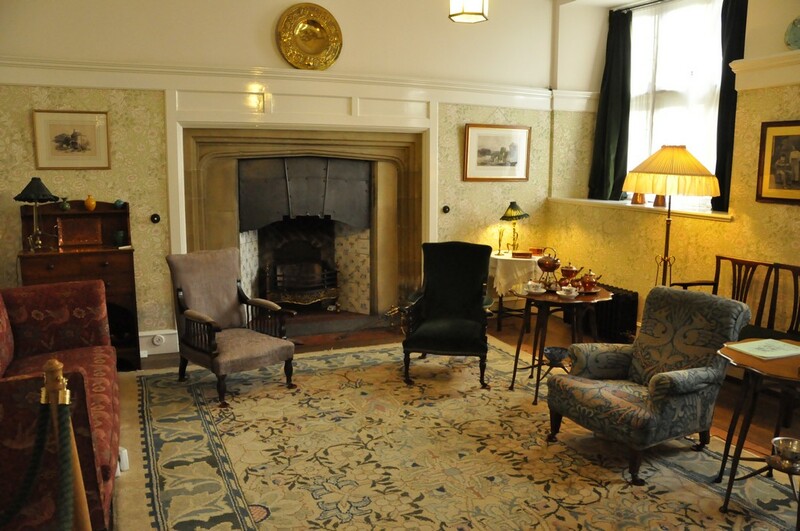 A full album of photographs of Barrington Court can be opened here. 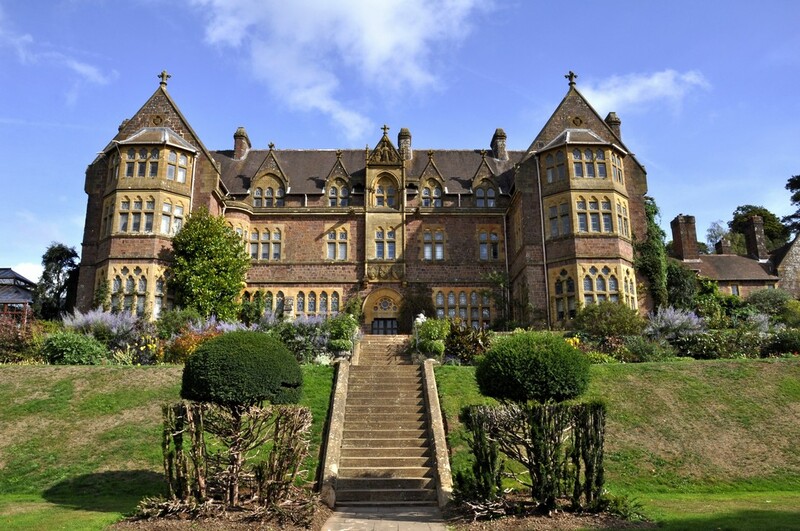 A week later, and we were headed north to take in Knightshayes, an imposing Gothic Revival mansion standing on a hillside overlooking Tiverton in Devon. Knightshayes is a late Victorian house (built between 1869 and 1874), designed by William Burges, whose design excesses never made it completely into the interior of the house (although the National Trust has refurbished one room following his designs). 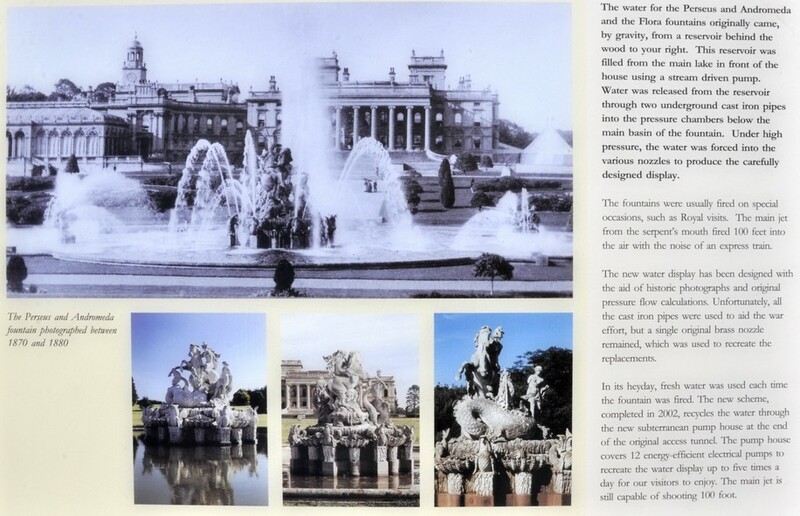 The gardens were designed by Edward Kemp. It was the home of the Heathcoat-Amory family for more than 100 years, and was handed over to the national Trust in 1972. 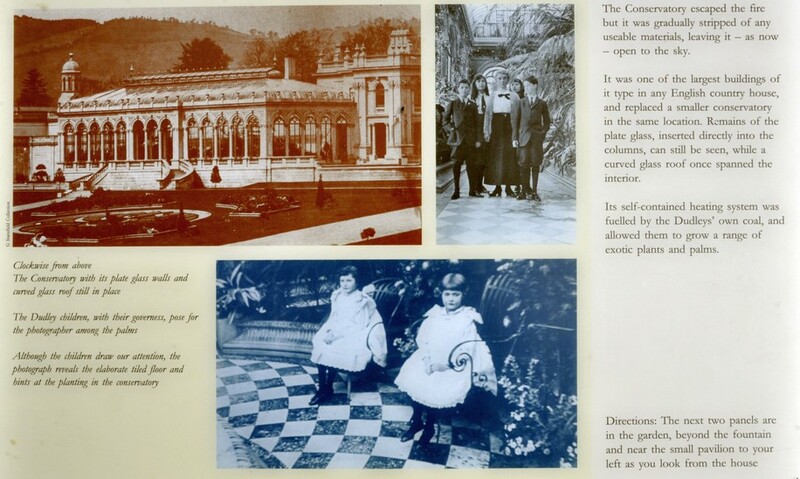 The last occupants, Sir John Heathcoat-Amory and Lady Joyce carried out extensive work on the gardens in the 1950s and 1960s; both were awarded Gold Medals by the Royal Horticultural Society. Lady Joyce (née Wethered) was a world class golfer with many titles to her name. 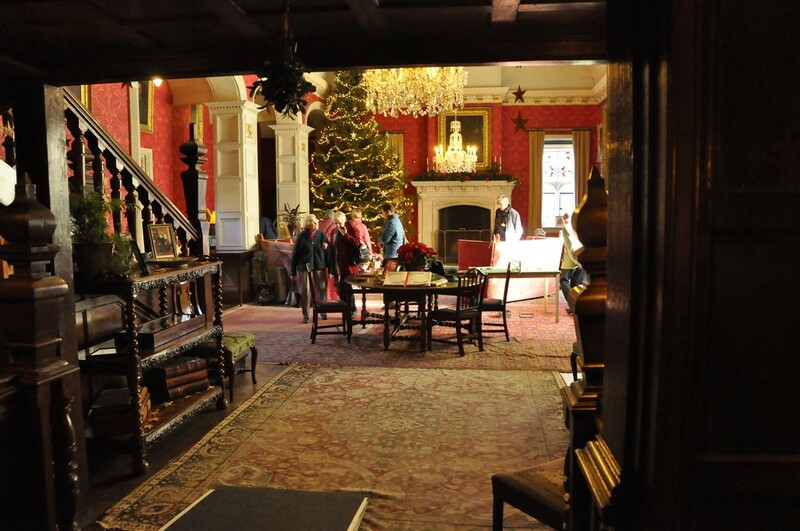 The interiors at Knightshayes are impressive indeed. The woodwork and decoration on the ceilings in many rooms is quite stunning. A few photographs displayed here cannot do justice to Knightshayes, so please take a look at a more complete (and annotated) album of photographs here. Knightshayes also has one of the largest walled gardens we have ever seen, and on the day of our visit there was a ‘heritage tomato event’. One of the paintings on display at Knightshayes was recently featured in BBC Four’s Britain’s Lost Masterpieces. 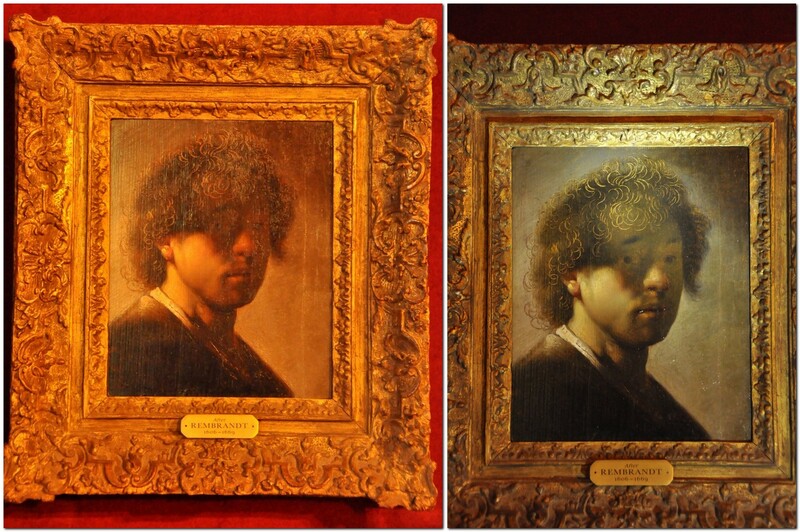 A small painting, not much more than 12 x 15 inches perhaps has been attributed to Rembrandt. Using the tool beloved of all art historians, a torch, we could highlight and see the detail in this beautiful small painting. But is it a Rembrandt? Perhaps. 3 September 1651. 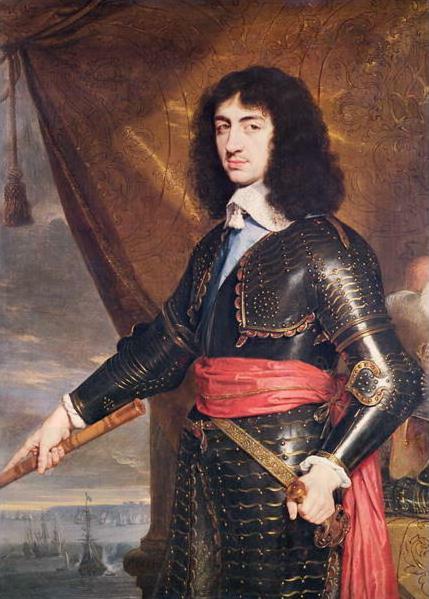 Just over 33 months since his father, Charles I, had his head removed from his shoulders on a scaffold outside Whitehall in London, the young Charles II (not yet crowned king) was on the run. A fugitive. His plans to defeat the Parliamentarians under Lord Protector Oliver Cromwell had come to nothing. Superior forces of Cromwell’s New Model Army had defeated the Royalists at the Battle of Worcester, bringing an end to the Civil War. Charles had to escape, but how to return to France and safety? His escape route took him north through Worcestershire (close to where I live, some 13 miles north of Worcester), and through Staffordshire and Shropshire to reach Boscobel House. The Boscobel estate straddles the Staffordshire-Shropshire county boundary (map). 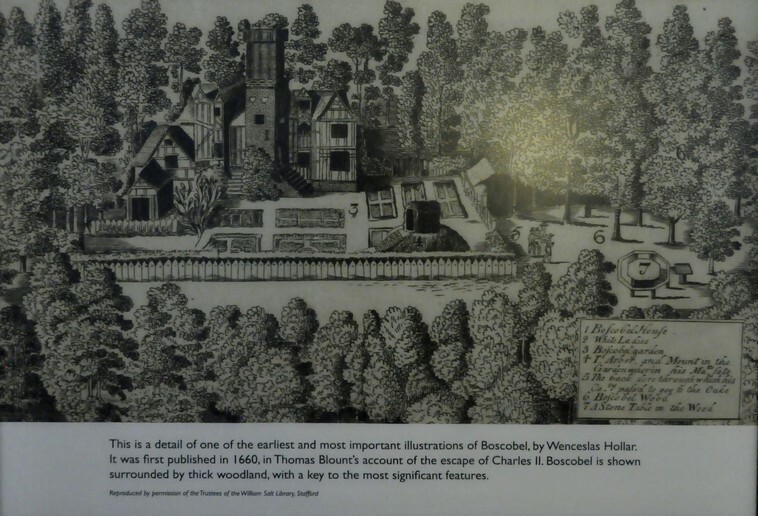 In 1651, Boscobel House was a hunting lodge in the forest. Charles found refuge there, not only hiding in a priest hole overnight, but also among the canopy of a large oak tree (the famous Royal Oak) close by, as Parliamentarian forces searched high and low for him. 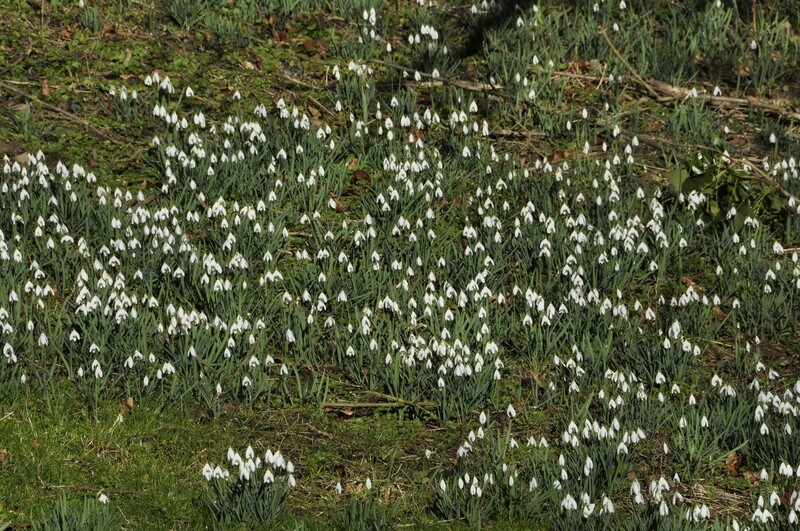 He was also hidden at nearby Moseley Old Hall (about 10 miles due east of Boscobel, now in the hands of the National Trust, and which we visited in April 2014). Boscobel House and the nearby White Ladies Priory (which was a converted residence when Charles sought refuge there in 1651) now belong to English Heritage. 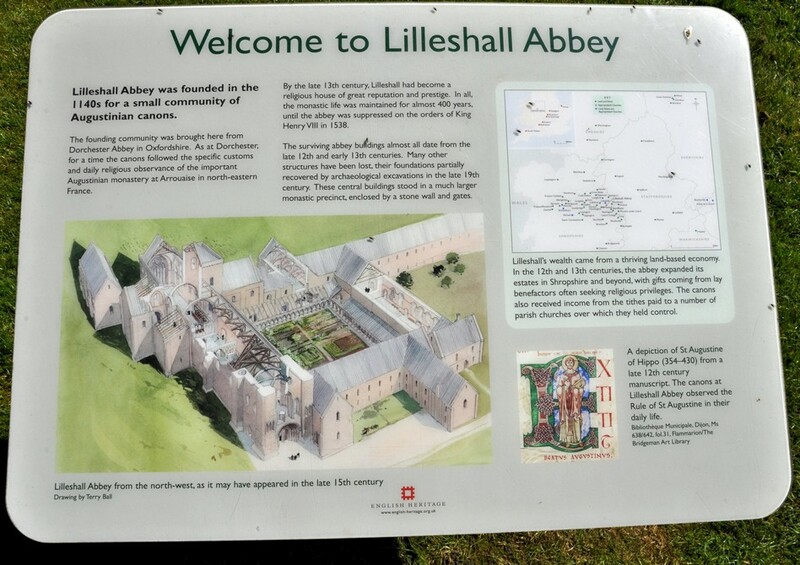 Yesterday, we made the 45 mile trip north to visit these two sites, and another English Heritage property, the ruins of Lilleshall Abbey, just over seven miles northwest from Boscobel. The house has Tudor, 17th century and Victorian extensions. The farmyard buildings are Victorian. 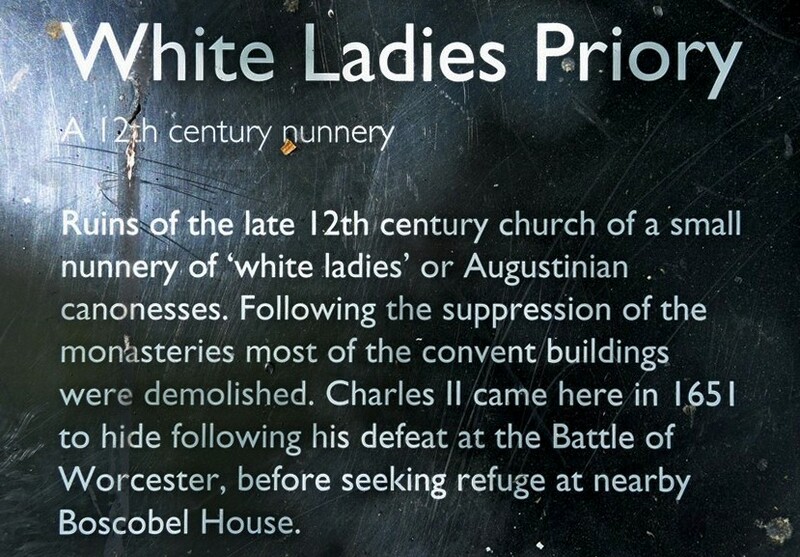 It was owned by the Giffard family who lived at White Ladies Priory. The lonely Royal Oak that stands in a field a short distance from the house is a descendant of the original tree in which Charles hid. 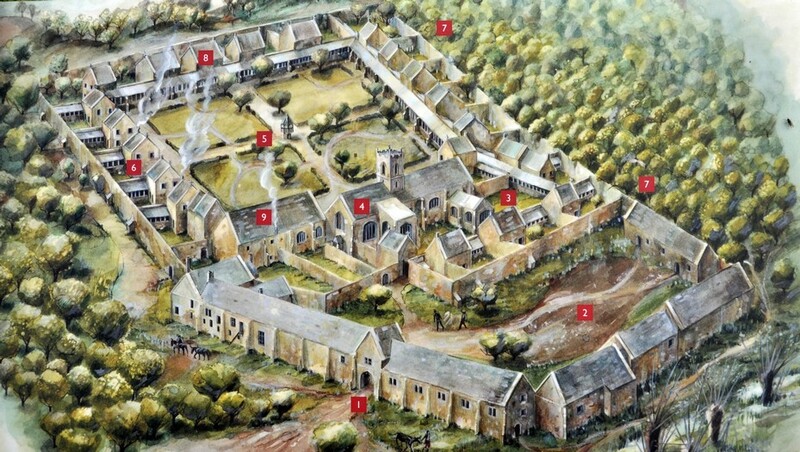 (1) Hunting Lodge; (2) Garden; (3) Cowhouse; (4) Stables; (5) Dairy display; (6) Smithy; (7) Family room; (8) White Ladies Priory – about 1 mile, 20 minutes walk; (9) Royal Oak – approx 5 minutes walk. To the left is the dairy, with the Tudor and 17th century hunting lodge in the centre. 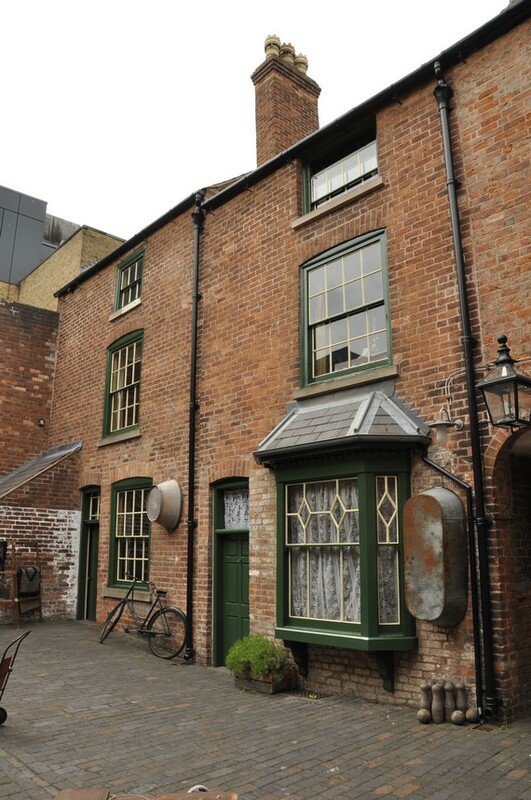 The Victorian wing is on the right, painted in black and white to represent a half-timbered Tudor construction. The knot garden and 17th century hunting lodge. There is a contemporary text about the ‘visit’ of Charles II to Boscobel on display in the parlour. A tapestry on the wall of the Oratory just off the parlour. This 17th century portrait hangs above the fireplace in the Oratory. 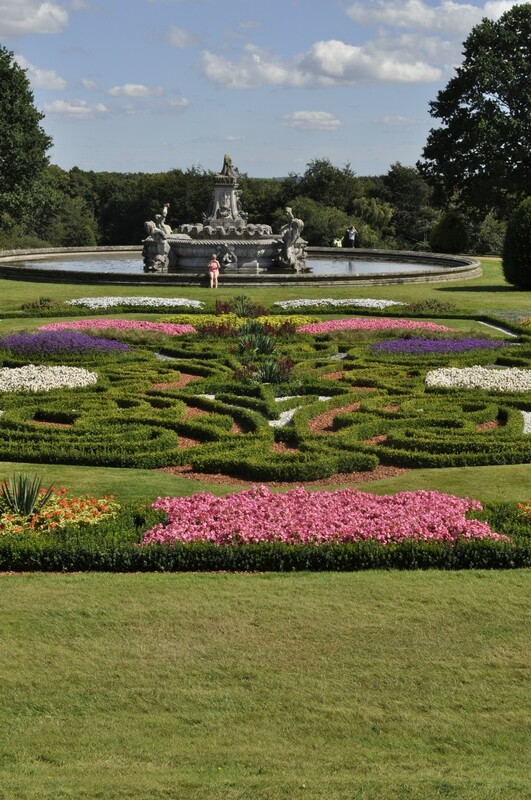 The knot garden from the Oratory. The priest’s hole from the Squire’s Bedroom. The priest’s hole in the attic where Charles II hid for one night.